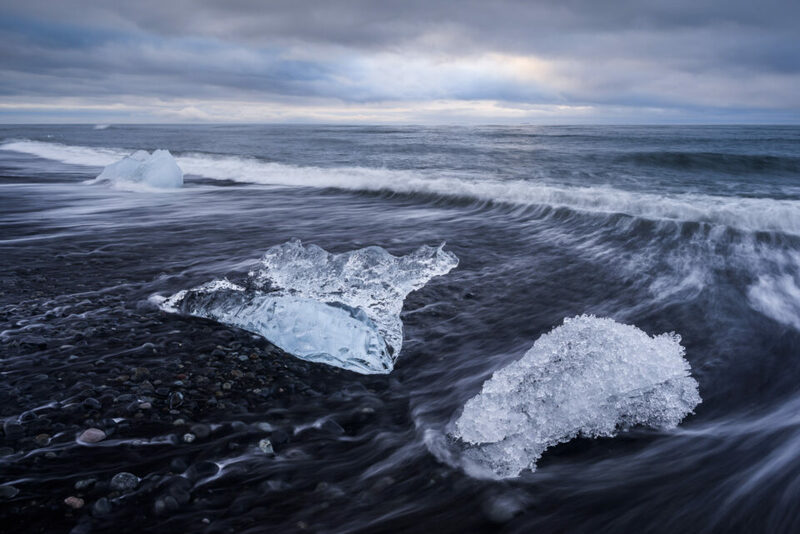 The first example is from Jökulsárlón Beach in Iceland, a fascinating landscape and almost a playground for photographers. 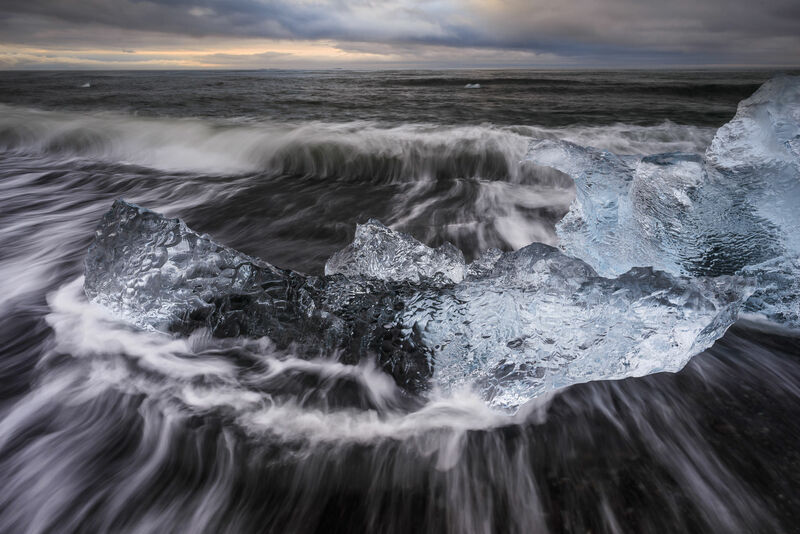 Melting icebergs flow out of a glacial lagoon and into the ocean, where some of them will wash back ashore. You’ll need to visit on a good day to find a large number of icebergs, but when conditions are right, it’s an amazing place to see and photograph. 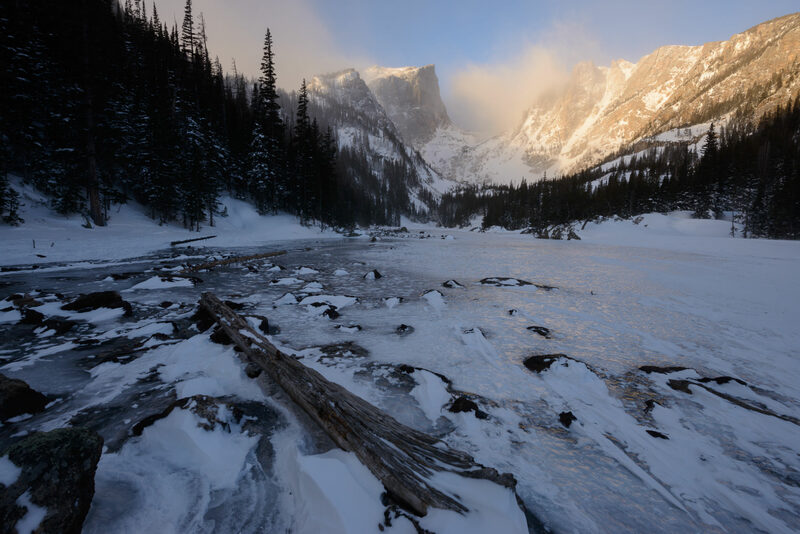 I’ve written before that “good light” in landscape photography (or any type of photography) is light that complements your subject. You don’t need to capture golden colors in the sky to make a good photo; sometimes, that might even be the worst light for a particular scene! If your subject is harsh, for example, you’ll find that gentle, golden colors will counteract your central message, and the photo is likely to feel disjointed as a result. The colors in the sky are nice, and the scene is interesting, but there just isn’t any deeper meaning or message in this photo. The iceberg is blue and sharp; the sky is orange and soft. Why are they paired together? It’s hard to find a good reason. It’s making progress, but the composition above is now a bit too chaotic and difficult to understand. I made the photo more dynamic, sure, but I did so by getting closer to an interesting block of ice and practically shoving it in the viewer’s face. How could I achieve a similar sense of movement with a more straightforward composition? I was lucky that the clouds had turned into a dramatic diagonal pattern in the meantime, but, as you can tell, it wasn’t a matter of just showing up and taking this photo out of nowhere. Almost of the compositional and creative work was already complete at this point. Each step of the way, I refined the message and idea I wanted to convey, and the result is a landscape photo with a much more cohesive message. 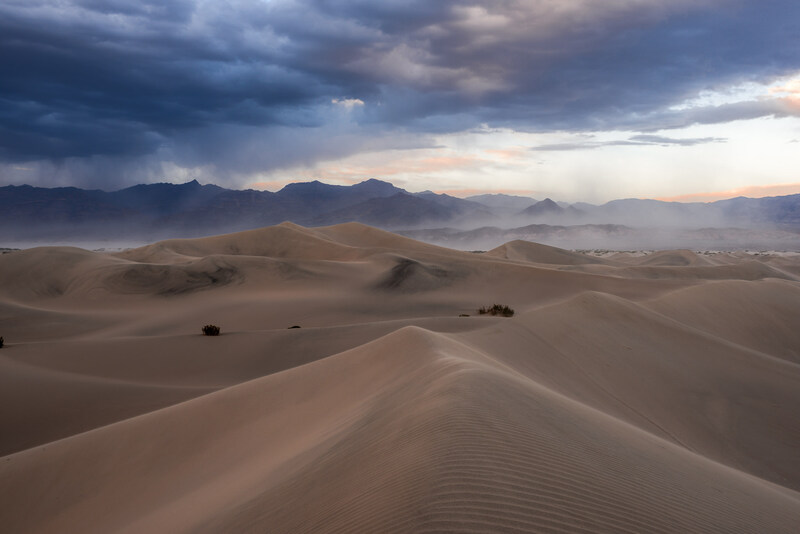 One of the most frightening and beautiful nights I have ever taken pictures happened in Death Valley’s Mesquite Sand Dunes as a sandstorm approached. More than an hour away from my car – but luckily with two good GPSs in hand – the atmosphere turned from clear and bright to an ocean of dust. 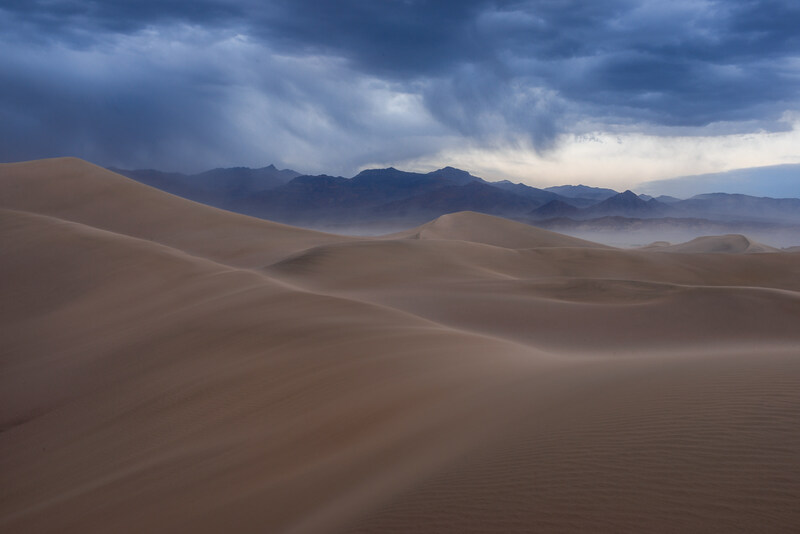 I took all the photos below before the sandstorm completely enveloped the scene, but just minutes after the last one (my favorite, and the one I still display today), visibility dropped precipitously. 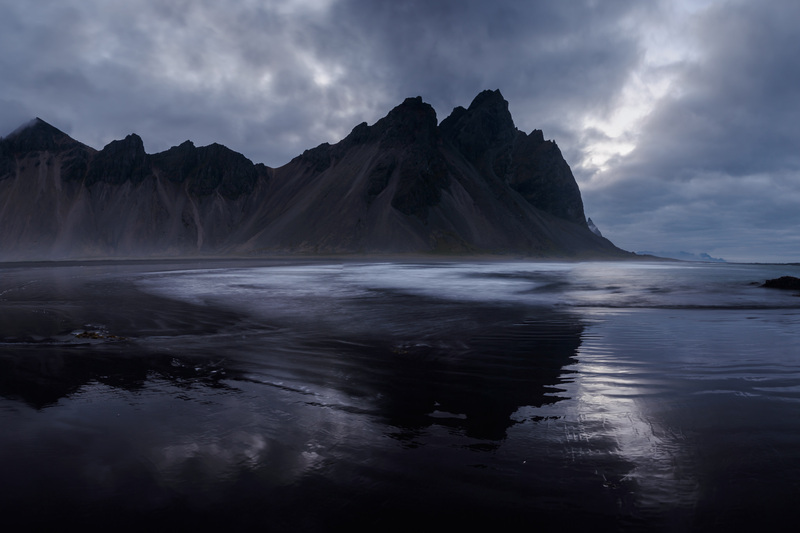 It should be no surprise that my goal here was to capture the landscape’s dramatic display of power and intensity. 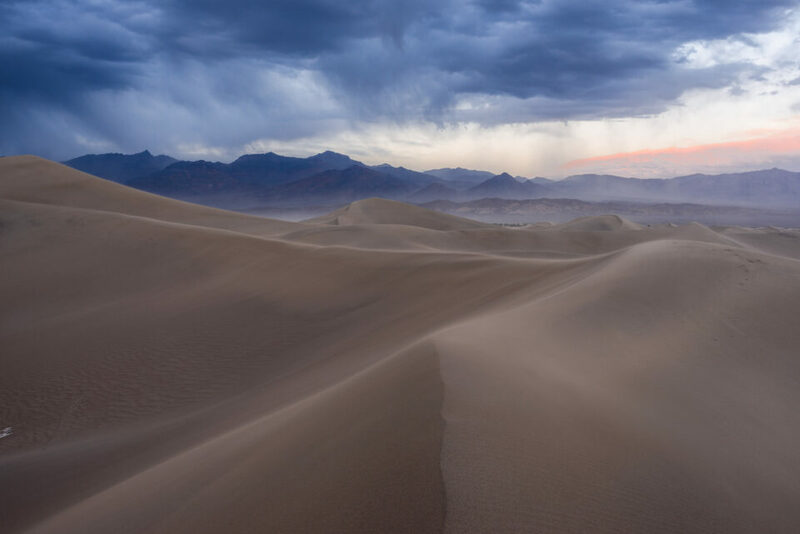 It is also critically important in a landscape like sand dunes to omit as many distractions as possible, since there will often be elements that can take away from your central emotional message as a photographer: footprints, shrubs, or other imperfections in the sand. However, the rest of the image has a number of problems. The foreground dune, for example, does have some interesting textures, but it also is a relatively awkward compositional element. 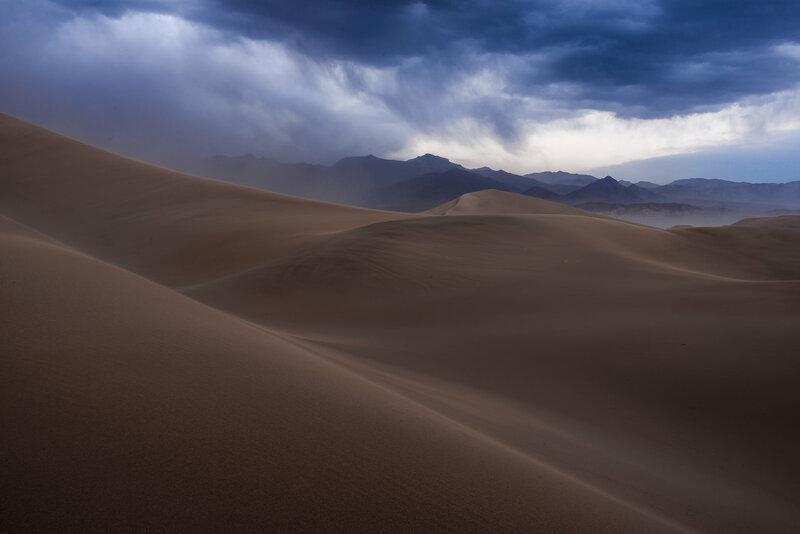 Specifically, its size is almost overwhelming, stealing thunder from the photo’s main subject – the primary subject, as Nasim would say – despite being less important. And the right-hand side of the sky isn’t doing this photo any favors, either, with a bright (almost cheerful) region that is decidedly different from the rest of the photo’s message. Perhaps those issues would be forgivable, but the middle ground of the photo is even worse, with a large number of distractions. The shrubs on the distant dune don’t add anything to the photo, but they do draw emphasis away from the more important areas of the image. 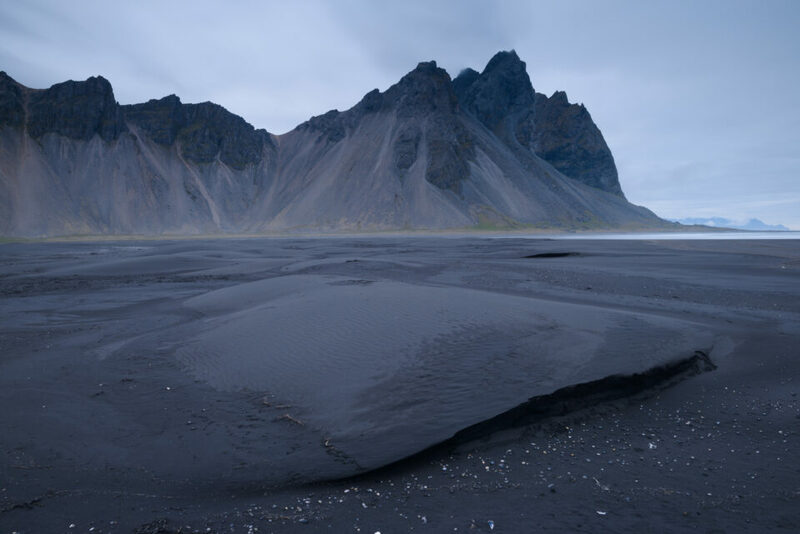 The same goes for the very dark sand on that same dune, which almost act as black holes, sucking attention away from elements like the distant mountain that should matter more. Making progress! There are still some distractions here (especially the white area of sand on the very left of the frame), but the overall composition is much better. The foreground no longer takes away from the primary subject in the background; it draws the eye into the distance instead. So, what issues still remain? Most of the composition and message are in place now, with the remaining issues comparatively minor. If my camera died right after this moment, I still would have been happy with the image – but there is almost always room to refine things even more. Even when you really like a photo, take a look at it and see which elements still have room to be improved. Here, although the composition is better and more balanced than in the prior example, the peak of the sand dune on the very left is a bit annoying. Although I could crop it out, that would place the intersection between the dunes and the mountain too close to the edge for my taste. I frequently like to leave the edges of an image with minimal points (i.e., two lines intersecting) and compositional distractions, preferring the boundaries of the photo to resembling a natural and continuous “frame” as much as possible. There we have it. Not only is the composition much better, but the front end of the sandstorm has nearly reached me (look at how the visibility changes on the small, very sharp triangular peak on the left in each photo). So, there is an added element of drama and intensity that works perfectly with my intended message! Not only that, but the pink and yellow colors in the sky are gone, replaced by a dark blue tone instead. 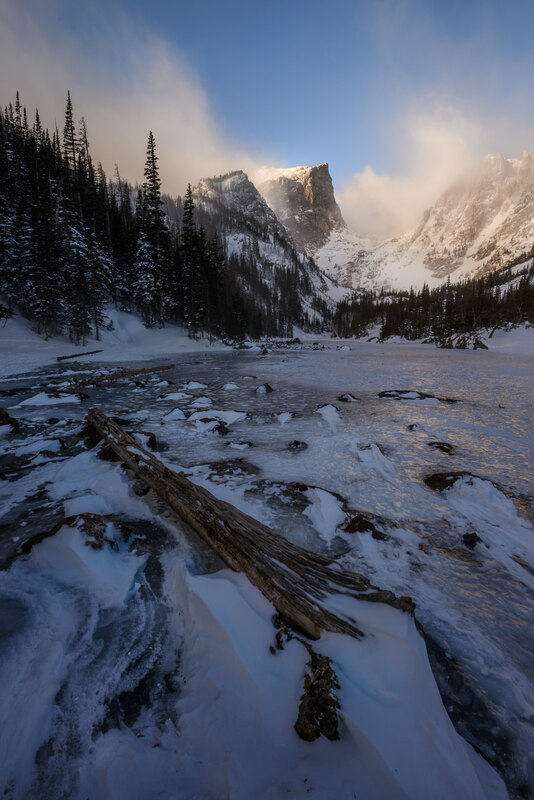 If you’ve ever tried running up a snow-covered hill at 9900 feet altitude (3000 meters), trying to make it to a location in time for sunrise, you must also be a landscape photographer with time management skills as… unrefined… as mine. But despite my tired legs after reaching the landscape, this sunrise is going to stick with me for a while. The cold beauty, the tremendous scale – it was simply amazing to see. That looks a lot better, although the new composition has some issues of its own. 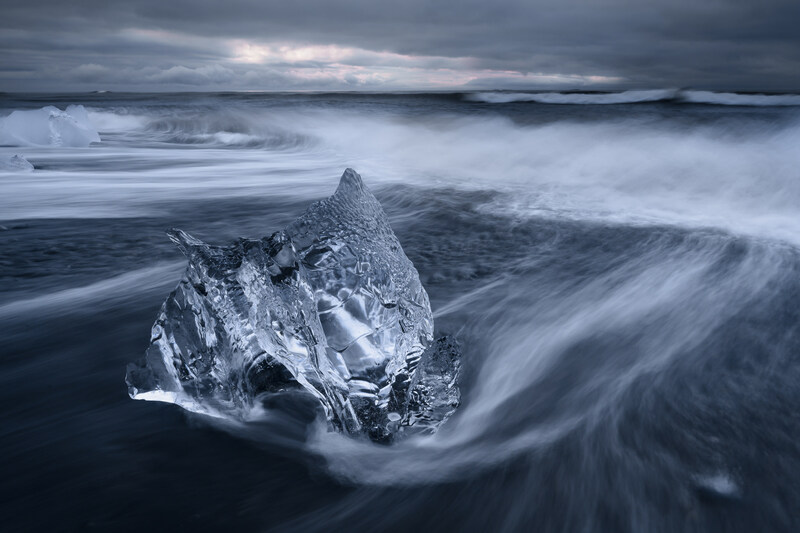 Although the foreground is much simpler and more direct, with a strongly defined shape to it, I still have a jumble of rocks to the left and an empty area of ice to the right. On top of that, the trees on the left are cut off by the top of the frame. 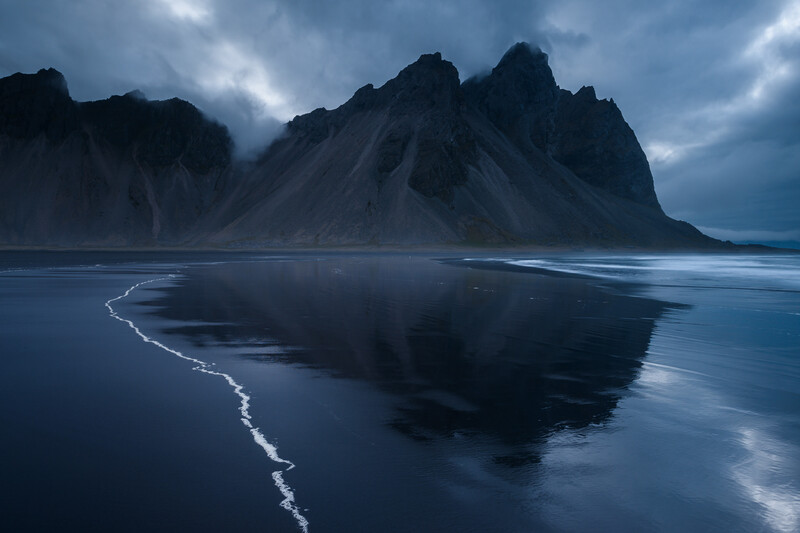 The last image I’ll cover in this article is of the famous Vestrahorn mountain in Iceland, taken from the Stokksnes peninsula. Blue “hour” in Iceland can last for several hours near the summer solstice, since the sun spends so much time hanging just barely below the horizon. So, you have a lot of time to refine your photos here! I figured that one of the best ways to make the photo more interesting and dynamic was to approach the ocean (visible at the very right of the image above) to see if some better foregrounds presented themselves. Soon, the sky started to get a bit brighter, throwing the mountain into more of a silhouette, which worked well; it added some intensity, matching more closely to the emotion of this mountain. Although it happens on occasion, it is rare that your first photo of a scene will be the best one you capture. By asking yourself – honestly and open-mindedly – which elements work and which do not, you have the ability to refine most of your photos in the field before it’s too late to change anything. The images above are just four out of the many such photos in my portfolio; well over half of my favorite photos have very similar stories behind their capture. Hopefully, seeing the whole path from point A to point B, rather than just the finished and polished version of these photos, gives you a good understanding of what it can take to capture the image that you really have in mind, even if you don’t recognize it consciously at first. Getting there involves a lot of recomposing, moving around, and building upon your earlier images, but the results are sure to be worth the effort. Cool article! Definitely something I should pay more attention to with my photography. Seeing the process through your images was very helpful. I guess Jordan is in full swing now, have fun out there, and say Hi To Nasim and Pat! Thank you, Harry! Jordan is going well, very beautiful here. Glad you enjoyed seeing the process on these photos. I like your articles a lot. I find them very helpful as I am rather new to photography. But I have experinced the same. How I return to a motive and refine it, or return to a motive that had completely wrong light the first time . One of these mornings I thought, perhaps this is the way of working for a professional photographer and I would like to see the way they improve their photos. And voila , there is your article. Glad you enjoyed the article, thanks, Lars. I thought I’d just mention, that in your black mountain series, each one of the photos in that series has it’s own beauty, and to my eye improves upon the one before. I think your final image is just breathtaking, and is my favorite of all the photos that you’ve shared on PL. Thank you, Elaine! 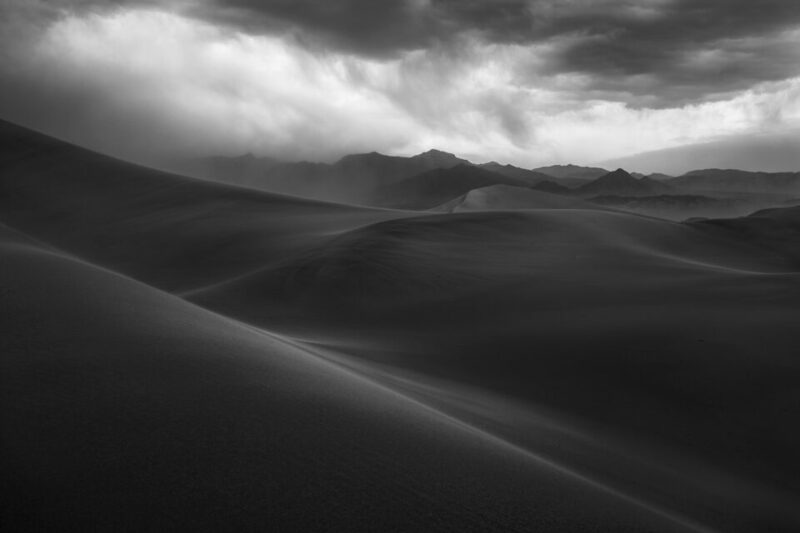 Not presumptuous at all – I find your analysis very intriguing, and I am starting to see the sandstorm photo in a different light now. This is what I like so much about photography! I almost always try to go for simplicity in an image, but sometimes losing too many details can make the story less rich. I can’t say that I will probably change the photo I display from that night, at least not yet, but you gave me a lot to think about. And I’m glad you liked seeing the process for the mountain photo as well – I think its step-by-step refinement process is kind of fun, as new elements in the scene popped up and offered different ideas over the course of the morning. Thank you for sharing your process. Each image is stunning! Very glad you liked the article and images, thank you! Phil, maybe you just need to go out of town for two miles and take whatever camera you have? I do like going to crazy locations when I can (although the Rocky Mountain one was easier, since I was working in Boulder at the time) – but the refining process also applies to landscapes closer to home, or other genres like portraiture, macro, and so on. Though I’m sure you already knew that! remind me every time before I press the shutter and become a better photographer. Sompoon, thank you, I’m happy you liked the article so much! There is always some process of refinement along the way; I hope you can make the most of it in your own photography. Love this article. This shows how much effort and dynamic adjustment photographers needs to make to show case their best images. A great example of what goes behind the scene and love your thinking process and explanation given on why things work and why it won’t. Thank you, Venkitesh. There is a behind-the-scenes process like this for almost every photo I display, and the early photos often aren’t pretty! But if you can pinpoint elements in them that you like, then simplify and highlight them as much as possible, you’ll build toward a better and better photo in the end. Very happy to hear it, thank you, Ashim! Thanks for this nice and helpfull article, as usual. Glad you liked it, Yannick, thank you! Part of this is really down to screen size – it is tricky to judge a photo from a small screen when you are going to display it on a large monitor or a detailed print in the end. Images with too much complexity in their little details can look just fine on the back of a camera, since you don’t notice how distracting they are. And the same is true with large areas of empty space or muddy details, which don’t appear obtrusive when you are just looking at the camera screen. To me, it helps to know about these issues and take a few different compositions when you are capturing an interesting subject. Don’t try to look only at your rear LCD or viewfinder – instead, pay just as much attention to the scene in front of you. Look up. Think of it as an enormous print, and pay attention to the details. Somewhere between the real world and the LCD is how your final image will look. And at the same time, if you’re unsure whether the small image will translate well into a full-sized print, it is still worth capturing, since the answer may be yes! So useful. I feel overwhelmed by landscape and want to put everything in the frame, or I just don’t know how to position myself or what is right and wrong. Your analysis is very helpful. Taking our time before clicking is also so important. Thank you, Clarisse! Taking your time, assuming the landscape is not changing too much, is a highly underrated part of taking good pictures. If you slow down, you can analyze exactly what works and doesn’t in an image, and see if there is a way to improve the relationships among the best parts while excluding the worst. I’m glad you found this article to help! Very happy you liked it, Barbara, thank you! Thank you, Mark! It’s often tricky to put creative variables into a step-by-step article. I’m glad you think this one succeeded. So how did you remove the distractions from your shots? Did you use software and if so what products did you use. At the moment, I use exclusively Lightroom for most of my photos, although I’ll use Photoshop for more complex things like focus stacking, or to create graphics for Photography Life. I try not to remove anything from the photo with spot healing unless absolutely necessary. In the images above, I don’t quite remember, but I think that the vertical photo of the mountain and log had a couple bright specks on the dark wood at the bottom, which were easy to clone out. There was also a small bright spot in the sand on the dark blue mountain photo that I removed. I believe the only other spot healing I did on any of these four images was to remove dust. Over the past few years I’ve been moving in the opposite direction: shooting a scene multiple times, I’m finding I’m more likely to use the FIRST image over later ones, at least as far as composition goes. Interesting to hear! I do wonder why that would be. Perhaps the first photos you take tend to do a better job conveying the emotional message you feel at the scene, since they are more spontaneous and less likely to be over-planned. But there could be any number of reasons – no two photographers share the same process. I sometimes find the same. I’ll snap a photo somewhat thoughtlessly, then go through a whole refining process, but ultimately when I go to edit photos it is often the very first photo that I end up picking out of the series. Sometimes, specifically with sky and water, that first moment captures exactly what you thought was interesting – then the clouds shift a little or the rays change or something and that moment is gone. Very informative article. Can I remember to do this in the field? Important question! It really comes down to looking at the photos you just took, or at the scene in front of you, and asking yourself which elements you like and which you don’t. But there is an element of doing what comes naturally to you anyway, so if that conflicts with your current process, it might not be easy to implement. Excellent article! A very thoughtful reminder and explanation of training one’s eye, and the subsequent positioning of the camera, to tell a story. Thank you so much for sharing. Much appreciated. Thank you, Astrid! Absolutely, it is all about positioning your camera to match your vision, rather than the other way around. Nasim likes to say that you should set up your photo before you set up your tripod, and I completely agree. Just standing at a convenient spot or keeping the tripod at its maximum height will limit your possible compositions significantly. I really enjoyed this article and found it useful. Thanks. Much appreciated, Michele, I’m glad you enjoyed it! learnt that a good image is a process of many trial images. Reassuring enough that you do get a good image after putting in efforts of many trials. You visualise all that you have written, by seeing the preview on your camera or you see it on a bit of larger screen of laptop? Yes, it is very rare (at least in my personal photography) that a good image came out of nowhere, without any trial shots or tests ahead of time. As to your question, it’s all on the rear LCD screen of the camera, or occasionally the viewfinder. A larger screen helps more than many people would think, but it’s still possible to go through this process on a small display. Also take a look at my response to Yannick above, number 9.1, for a bit more on this topic. Gosh Spencer, the final images are spectacular! On my next landscape journey, I’ll try different angles and locations. Thanks for a great article! Renee, I am glad you like the photos, thank you! It’s always surprising to me how much it helps to walk around and try out wildly different compositions, not just variations on the first tripod position at a landscape. 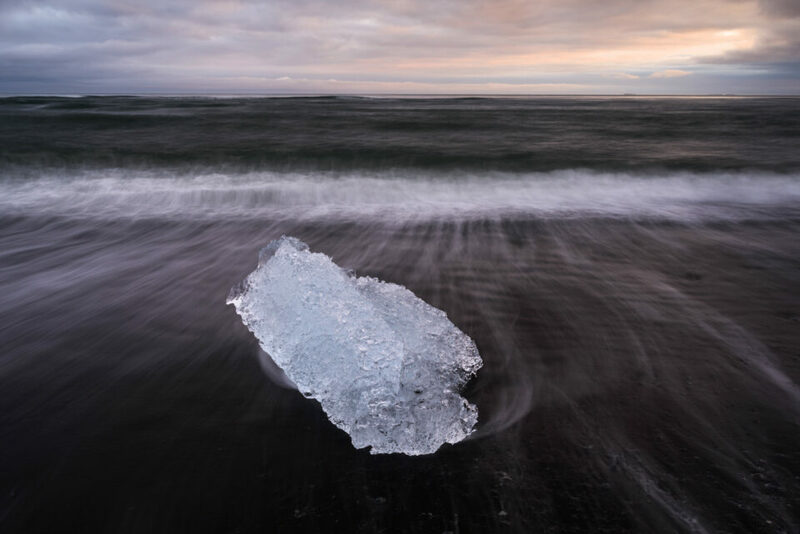 With the exception of the iceberg photo, all the images above occurred at the end of a walk into the landscape, with each subsequent photo in the series getting closer to the horizon than the last. Great article. Thanks for sharing the process you use and what you were thinking at the time. I have much to learn!! Thank you, Richard! I’ve always found it useful to see the behind-the-scenes process for photos I like; glad the same was true for you in this case. I wish more photography teaching materials, be it blog posts or even videos, were produced like this. It’s exactly what we need to learn. Your humbleness in showing the “draft” shots and how you worked each one until you got what you wanted really, really helps. Thank you so much for sharing this with us. I’ll keep what you say in mind and try to do more articles like this, thank you, Tulio! Good photos don’t happen in a vacuum – there’s always a process of some kind behind their creation. 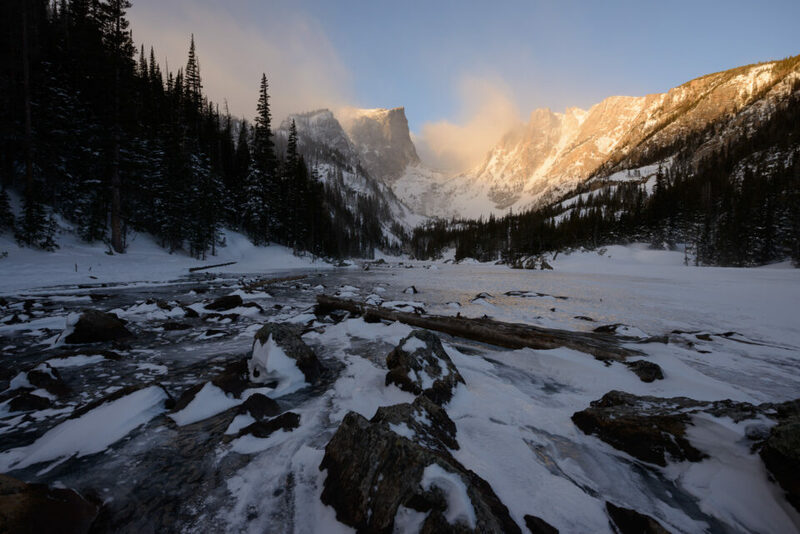 I’ll pile on here: I’ve engaged in what I consider to be two significant learning experiences (beside my actual imaging) to improving my photography this year: 1) attended a John Fielder talk at Royal Gorge where he explained his thinking behind composition, and 2) reading this article. And for me, it’s not necessarily about “do this and it’ll work better”, it’s about how someone else thinks and mapping it to my experience. Excellent example of how an image can be recomposed under almost same exact conditions. Too often I hear advice on cropping out this or that. Instead, we should move around and experiment with different angles. Minor variations in composition can make a huge difference. I like to think that the best zoom lens is your feet. I’m pretty sure that there are things that I’ll really help me improve on your article. So, that is an excellent article, thank you! I love your articles plenty. I discover them very helpful as i am as a substitute new to pictures. But i have experinced the same. How i return to a reason and refine it, or return to a cause that had completely wrong light the primary time . Such a mornings i idea, possibly that is the manner of working for a professional photographer and i would love to see the way they improve their pictures. I’m a guy of 18 with a lot of passions and right now I’m approacing to photograpy. I started to read some articles from photographylife and imho they are absolutely perfect. I can clearly see the love you put in what your’re doing, and as I keep reading, photography became more and more interesting. The fun thing in this article is that when I looked at the first attempt of a shot, I often had the same feelings of yours. For example, the last pic of the Rocky Mountain convey the best message and harmony. But the most satisfying part is when i don’t agree with you. 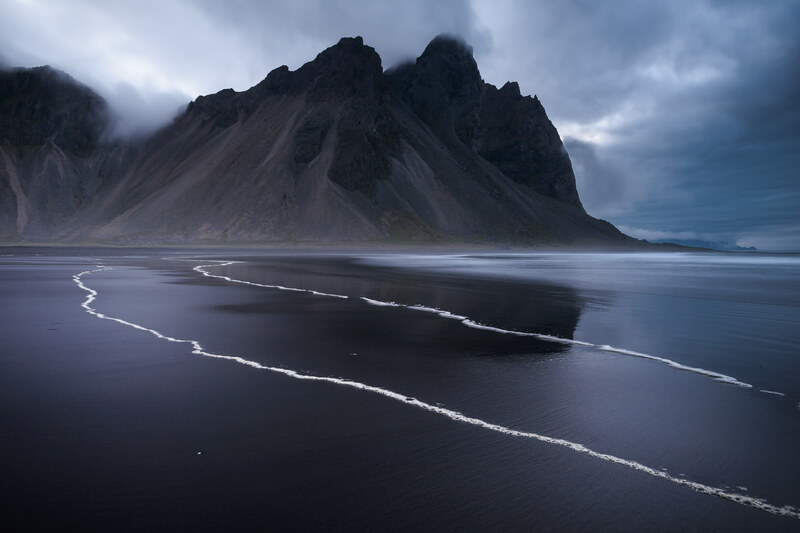 An example: even if the second pic at Vestrahorn mountain has something “wrong” (the waves pattern), the light is astonishing. This led me to prefer the second shot over the others. Luckily, photography is subjective, and to me, a way to escape the rigidness of my other passions, like computers and physics. I don’t have a camera right now but I’m saving money. Meanwhile, I just enjoy watching other’s pictures. Sorry for my poor English but I’m from Italy.